Seriously what is he smoking? Why pick this target? Just because the guy said a massive rigid metal tube couldnt fit around underwater turns that divers had to remove their air tanks and contort their bodies to get around? So Lin Wood is bringing the case. This is going to be fun. Wood has a history of handling small guy being picked on by the big guys (usually media) cases and winning. He fights very very dirty. 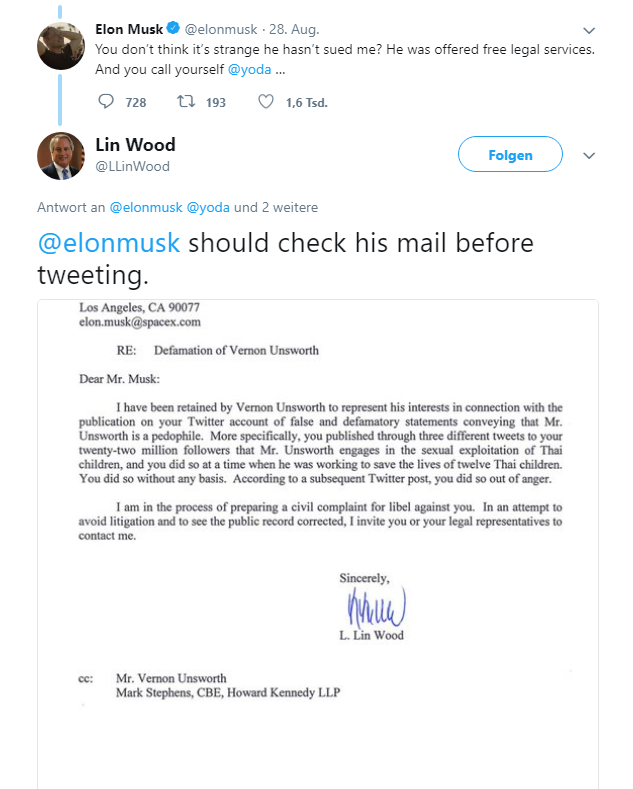 Which given just how much dirt is out there on Musk and his associates this has the makings of a real shitfest. The choice of venue will be interesting. If I were Musks legal team I would hope it is not in LA. As for Musks behavior. Its not so much that he is a coke head, which he is, its that it is the standard modus operandi for fraudsters and conmen. A quick review of the criminal trials, bios, of other conmen in the past will show exactly the same behavior pattern for the straight up criminal psychopath. What are the odds that Musk either “ODs” soon or otherwise “steps aside” temporarily for “health reasons” and goes to one of the celebrity rehab resorts were management agencies usually park valuable talent when their behavour gets too erratic and self destructive until the media attention dies down. Either way, big bag of popcorn time. Until the inevitable end. Now for the real Hollywood ending I’d suggest that Musk takes a SpaceX launch vehicle into low orbit that mysteriously burns up on reentry. That should give a satisfying story arc ending for the inevitable highly sanitized biopic. Those of you who know LA will know that this suggestion is only half in jest. Its that kind of place. I have a new model Nissan Leaf - I don’t use their version of autopilot but the car does have radar / emergency braking switched on which is designed to avoid imminent collisions. At this stage, I’m considering switching it off as 2 - 3 times a week the car slams on the brakes when it really doesn’t need to. How is the rest of the car, mush better than the old one ? Except that on this part of 101 when traffic is light, like the early am’s, is exactly the sort of place you stick on cruise control. There is a long stretch between south of Gilroy, around San Juan Batista, and just as you get to the 85 interchange where I’d pretty much always have cruise control on the whole time. Tesla drivers are not the smartest folks, so its almost a certainty he had autopilot on. I wouldn’t say ‘much’ better in that many of the strengths of the new one are the same as the old one, just somewhat better. Extra range makes a big difference, and added power is noticeable. Much better looking, but that wouldn’t be hard! Confirms my suspicion that general acceptance of autonomous driving is light years away. HTF do you run into a stationary target on 101 which – despite jmc’s opinion of my closeted existence – I am pretty familiar with though more so with Cupertino / Saratoga / Los Gatos, having done a ton of work for Apple in the former and had my own US HQ in the latter. If Tesla can’t handle the roads round there I won’t expect to see them on my local boreen anytime soon, if ever. regarding the artificial intelligence, even Uber are putting efforts behind bikes instead of cars. The predicted outcomes when algorithmic infallibility meets “expect the unexpected”. I think it also goes to show that autonomous vehicles will never be completely autonomous, all road vehicles would need to have a “beacon” of some kind to avoid this type of incident in the future along with active road sensors to provide additional feedback to autonomous vehicles. Smart technology works best when it is used in conjunction with sufficient sensors to avoid silly mistakes that are caused by relying too much on just one vehicle’s sensors! Just imagine landing a commercial aeroplane at an airport that has no runway lights, equipment and no ATC etc. What an odd thing to say. Anything to back it up? You’d imagine with the price of the cars Tesla ownership would select for successful people who would generally posses above average intelligence compared to all car drivers. Smarter people are more likely to buy EVs due to the fact that they are clean running on the roads, the source of the electricity is another issue. There is nothing to stop lottery winners, heirs to fortunes etc from buying Teslas, but the dumber ones tend to buy high spec sports cars that they don’t know how to drive properly. The Tesla drivers I’ve seen in the Bay Area over the years are the basis of the statement. Plus most Tesla cars are leased. Given their rate of depreciation they are even worse buys than US luxury cars. Prius drivers tend to be crap drivers but other than that the other marque EV / hybrid drivers seems to be like the fairly typical Honda / Toyota drivers. i.e mostly unremarkable and inoffensive. I suggest a lunch time spent wandering around the Stanford Shopping Center in Palo Alto, whose parking lot is chock a block with Teslas, will soon disabuse you of this particular illusion. A very affluent lifestyle and having Ivy League creditalization is no indication of either superior intelligence or smartness. Is it just Tesla you despise, or is it EVs in general? Well EV’s are little more than a big tax payer scam to subsidize affluent middle class virtue signalling. I worked out a few years ago that I personally was paying at least $10 per month extra tax just to pay for the CARB / CA EV subsidies. Plus at least a $30 a month extra electric/gas utility bill to subsidize “renewable” energy. So I pay about about $500 a year extra to subsidize this people. So just in California alone a serious multi billion dollar a year boondoggle. Which is all it is. Take away the massive tax payer subsidize and the EV/hybrid market segment would rapidly collapse. As for the people who buy these EV’s / hybrids only the Tesla people seem to be total assholes. And given that the Musk / Tesla operation is a straight up fraud anyway whats not to hate about these people. Further evidence in the case for the prosecution. A fairly typical local Tesla owner in my experience. A complete idiot with a massive sense of entitlement. er what? its an out of warranty car that he decided to repair himself, like 1,000s of people every day. in what was is he a complete idiot with a massive sense of entitlement? Because he lives on an island outside of Seattle, Furstenwerth getting into a Tesla service center required a long drive. He wouldn’t always be guaranteed to have a loaner car to get him back home, either. Tesla did not offer its Tesla Rangers service, a kind of mobile mechanic that comes to an owners’ house, where he lived. And when was the last time you personally did an out of warranty repair on a recent year car? You know, the ones with the very complex electronics that you need vendor specific tools just to get the non generic diagnostic codes? Changing oil or light bulbs does not count. I own very old cars, with very simple electronics, and I leave the repairs to people who actually know what they are doing. And I have the shop manuals. Plus most Tesla cars are leased. Actually Tesla don’t release those figures. The vast majority of all EVs in the US are leased, but don’t forget that none of the Model 3s are leased from Tesla. So the total is likely under 50%. Given their rate of depreciation they are even worse buys than US luxury cars. Nope, the Model S has the best rate of depreciation of any UK car. For leased versus sold outright, just read the 10K’s for the last few years. All the numbers are in there. Or can be inferred by some very simple arithmetic. Tesla dont have a separate leasing company like all the other real car companies have. Very few Teslas sold in UK. Almost 50% total production sold / leased here in California. So there actually is a second hand market here. Just check the local craigslist for what they actually sell for. We are in Cadillac depreciation territory. And dont try quoting Kelly Blue book numbers. They have never applied here. Way too high. And has been since I bough my first used car in 1987. His writing style is very familiar. Who knew that writing “off the record” on the top of something could save you from defamation? !